I’ve been thinking about it for a long time, and Brandon is on board (! ), so I’m gathering some inspiration photos of painted floors. The wood in our kitchen really isn’t in the best shape, and there’s an area by the stove where the woods aren’t even the same. I figure we’d have to strip the floors and redo them to really make them look nice anyway, so why not try painting them instead? *edit* I’ve posted photos of the floor in the comments below. 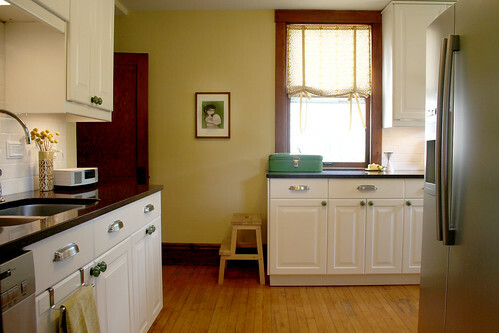 Nora painted all of the trim in her 1920 Chicago bungalow white… just like I could do to mine. It’s a love/hate relationship, me and all this wood. Please don’t paint the beautiful wood trim in your home! It gives your bungalow such a wonderful character that is hard to find in newer homes … it would be so sad to see that lost. i just wanted to tell you (& say congrats) in case you didn’t know but cs interiors (it’s not out yet, but i work for the magazine) is featuring your elemental cards! i read making it lovely all the time and when i saw the cards in one of the layouts, it made me super happy! I love painted floors, and I’m sure it will be much more budget friendly that refinishing them! I can’t wait to see the final result! 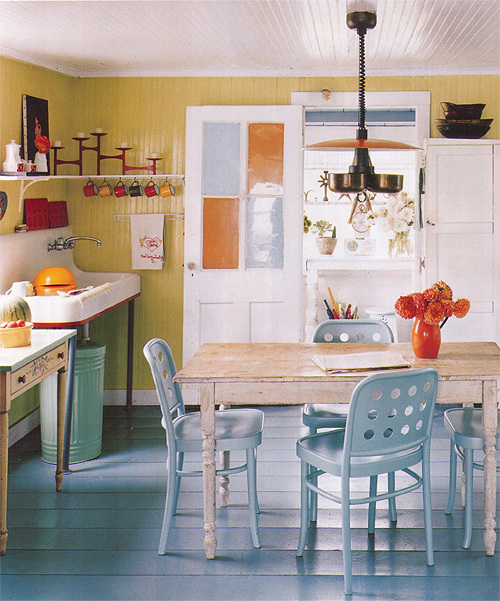 Anytime I see painted wood floors in magazines, I just love them! What color would you do? I think it’s a great idea if your wood isn’t nice enough to reclaim! What are the other colors in your kitchen? I refinished the wood floors (strip, sand, refinish) in my downstairs but was brave enough to paint upstairs. The prep work and paint choice make a difference. I suggest you try a closet first with the paint and finish. Despite having multiple rooms of finished wood floors and two (spare!) bedrooms where I love the painted wood, I do consistently have to hear people moaning about what a terrible thing I did. So be prepared. It is your home, do what you want. I love the stripes! OOooo I hope you do them! I hope you don’t paint them. The stripes especially are a bad idea…I can see them in a Cape Cod cottage, but not in your cozy bungalow at all! The painted idea is great especially if the floors aren’t that great to look at to begin with. I love the stripes idea and think red would look really nice in your kitchen since you have some red appliances! An olive green would look great as well! Love painted floors. We almost did it too. My second or third post had lots of painted foors. My blog started in January. I LOVE this look but don’t have the guts to try it myself. (And, my husband would have a heart attack.) If I ever had a second home, I would so do this. So, do it. I want to live vicariously through you! I loved that kitchen in Blueprint (R.I.P.)! I love the idea of painted hardwood floors if the floors aren’t in the greatest shape. It makes a kitchen feel so light and airy. Oh I love painted wood floors! I figure you’re going to strip & snad them anyway, well if you don’t like them painted you could always do that down the line anyway… I’m not sure about the stripes, but that’s just me. Heck, you could even do a large tile-effect! if it’s not great wood, paint it! not all wood is meant to be exposed in its natural beauty. i painted some old pine throughout my house, with deck paint. love it. after 4 years, lots of sandy bare feet, many dogs it still looks great. i love the fact that NO ONE likes the idea! lol its hilarious…OR THEY SUUUUPER LOVE THE IDEA…like everyone loves you..so they hate to say…”awwww nicole..i dont like it!” i love this! when i read your blog im always surprised on what you do with things i would never even think to do…like who really thinks to paint floors these days…so even though im not this huuuuge fan on painted floors..although my grandmother has them in her kitchen…painted white..and they are chipped..with brand new cabinets and stainless steel appliances..and total kitchen renovation…but she loved the floors soo much…she wanted to keep them as is! and it makes me looooove her and HER kitchen even more…like ooh i love them! but sorry i got wwwwaaay off track….im always surprised on the things you do..and i would looove to see this done in your home! because hey…if you dont like..refinish them! 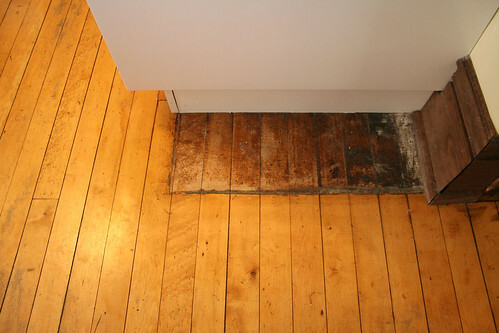 stain them…and then if you dont like that..get new floors.. I have painted floors in my kitchen (1920 Craftsman style cottage) and I love them. I have talked to a couple professaionals and the floors are not reclaimable, so we are sticking with the painted look. We are getting ready to repaint them and I am looking for ideas. Right now they are a medium gray, which has grown on me to the point that I might stay with it. All of our cabinets are white and the island is a dark gray with tile top. The floors used to be a black and white diaganol checkerboard and they still are in our laundry room and I love them. I’ll be checking your blog to try to steal some ideas for my own kitchen- best of luck. p.s. as a dog owner I must tell you that it seems much harder to keep the painted floors clean, but the back door in our kitchen is where they come in and out, so that could be the main reason. I hate to say it, but painting the floors in your kitchen is just a bad idea, design-wise. This issue has me all upset and it’s not even my house…Why is it so important to me that you not do this? Another vote for loving painted floors. If you’re not happy with how they are looking, go for it. If it gets chippy down the road, you could always have them stripped and refinished then. I think it’s hilarious how bent out of shape people can get over the prospect of painting wood! They would go into cardiac arrest if they saw my house–ALL of the woodwork is painted! I particularly love the third one down, but you’d have to keep the rest of the decor fairly plain, I would think. *gasp* I love it too! And Anna, thanks for pointing that photo out. I’m thinking of doing some sort of pattern with part of the wood exposed. I would have to say that my biggest concern is the fact that you’ve done your kitchen on a budget so far, and managed to keep it looking very not budget-minded…and I’m not sure painted wooden floors is in keeping with that. Unless you’re walking on some obscure, solid plank Zebra wood in your kitchen, I think painted floors would be lovely (and hardly criminal). Make sure you pick the right paint (as already mentioned) or it will chip fast and furiously. Painted floors were very popular here in the US during the 17th and 18th centuries, and from what I understand it was 1) to pretty up mediocre wood floors, and/or 2) an inexpensive way to imitate the gorgeous and intricate parquet floors and painted floors/furniture seen throughout Europe. We live in a house circa 1910 with gorgeous old wood floors. But when we refinished our attic into a livable space, we had to get out of the box b/c the floors were in such bad shape (and genuine refinishing was out of our budget). So I whitewashed them and sealed them…sort of like pickling. This way, the prep was very minimal, the wash/paint didn’t have to be perfect b/c the look lends itself to that – and it was fast!! Just have lots of cloth rags on hand to keep a wet edge. I love the way they turned out. I’ve done paint washes on tons of wood over the years on porch swings, homemade desks and in all sorts of colors from black to plum…they ALL look great and get tons of compliments. I think you have a great sense of style, so if you want painted floors go for it! I think a fun design similar to some of the ones we have seen would be awesome. Have fun with it & if you hate it just change it. No big deal! You said it is not GREAT wood so why not? True, but this house looks to be from 1910 or so. The craftsman style was all about letting the materials and construction be the ornamentation. The wood is supposed to look like wood. That being said, I like painted wood floors in certain situations, but the do have a tendency to scratch and chip, especially with a dog. If you’re really itching to paint some of the oak in your house, the floor is probably easier (but still expensive) than wood mouldings to undo later if you change your mind. If we are going to stick to time periods, then Nicole should probably toss out most of her vintage finds because they’re about 45 years too late for her house! And yet, I can’t see Nicole lounging on Stickley. I hear what you are saying. I’m a fan of Craftsman style, but I do think that there are some homes that represent the craftsman style better than others. In those homes, the reason the wood looks like wood is because of the superior quality materials used. Nicole’s already mentioned that the wood is not all original, and that the patch work is poor. In my mind, there isn’t much harm to testing out a design idea on a floor that will have to be refinished eventually. Similar to your Ikea rug this is a split down the middle opinion post, huh? I like the idea of painted floors. Done right they provide a really nice look. I am excited to see what you do. Either way, it will look fabulous. I say go for it. I actually really like the stripes and some of the other painted designs that incorporate some of the original wood finish. I have a 1928 bungalow where all the trim/molding is painted white with the exception of the dining and living room. Sometimes I am really sad that all the molding is painted but other times I understand why it was painted. Someone in the long line of owners did not take very good care of the molding and so it actually looks better painted. I digress. I think you have a great sense of style/decorating and so I would love to see how the painted floors works into your house. my goodness. ^^^^he’s crazy. but i wholeheartedly agree. I’m the owner of the kitchen floor Anna mentioned and linked above:) The pattern on it is stained and varnished, not painted. The reason I did it was because the floors leading in and out of the kitchen are oak and the kitchen floor is pine. I wanted the wood to match colorwise but didn’t want to stain the whole floor. The product I used is great, it’s called ZAR oil-based stain. 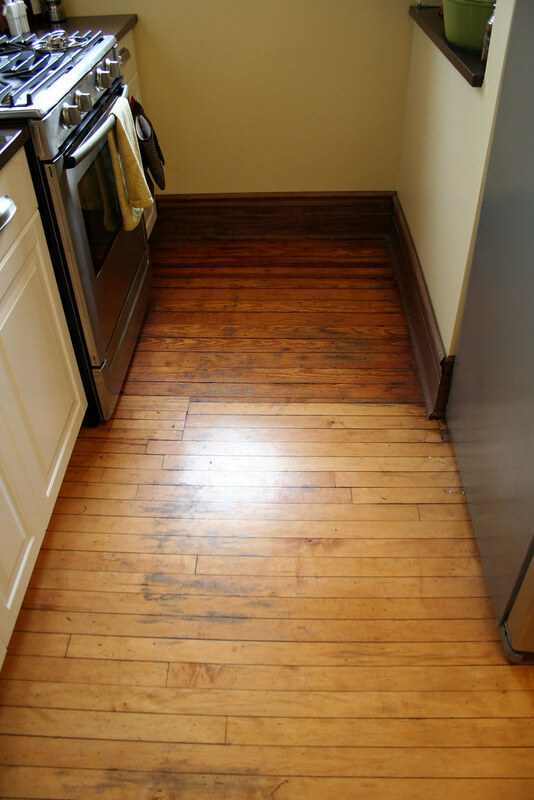 It doesn’t soak into the wood as quickly as other stains so there is time to fix little mistakes when they happen. The colors I used are called 138 Spanish oak and 139 Country white. I have a painted floor in my house too. It’s in a room we don’t use much downstairs. That floor shows wear and tear more than the kitchen floor so if I were you and was going for it I’d use the stain method. I stained my floor about 6 years ago and it still looks good. one traditional way of making painted wood floors that are easier to keep looking clean (because the color areas are irregular) is spatter painting. a relative of mine had this in her house in edgartown on martha’s vineyard and it was really great. on the whole I think painted floors/painted woodwork generally can look lovely, and if the woodwork is something you don’t want to touch for various aesthetic/historic reasons, painting the floor a light color could be a good way to lighten things up. 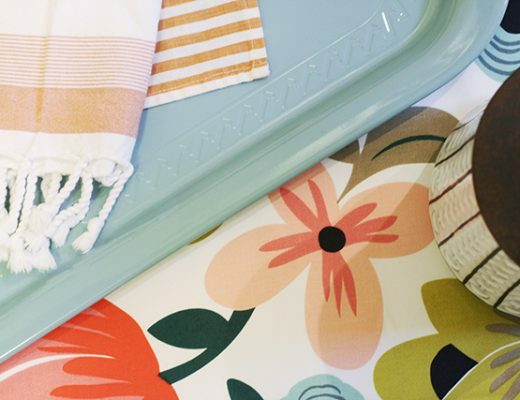 I really like painted floors – and I’m sure you’d choose a gorgeous color or pattern! I say go for it! Sounds like the stain is the way to go. I re-stained my banisters and dark color and painted the spindles white. While the spindles get virtually no wear, they need touched up already. The stain on the banisters, however, looks great. It was a gel stain with easy clean up. I don’t have a decisive opinion on painting wood, or painting wood floors, other than well, it’s the kitchen, it’s going to get a lot of wear, and without really doing any research, I’m going to guess a few days without being able to go in your kitchen. That will be true no matter what flooring option you go with, though. How to choose the right paint, how to pick the right color.. it’s a big job. I looked at the kitchen so far and sort of think the wood does nothing for it. It’s like the opposite of that striped rug from the dining room in there. For a very “active” sort of room, it’s kind of a void surface currently (not meaning as wood, but wood that needs refinishing in the first place). I like the checker pattern in that really dark photo, or pick up some of the green. Have you already returned the rug, why not put a rug in there instead? 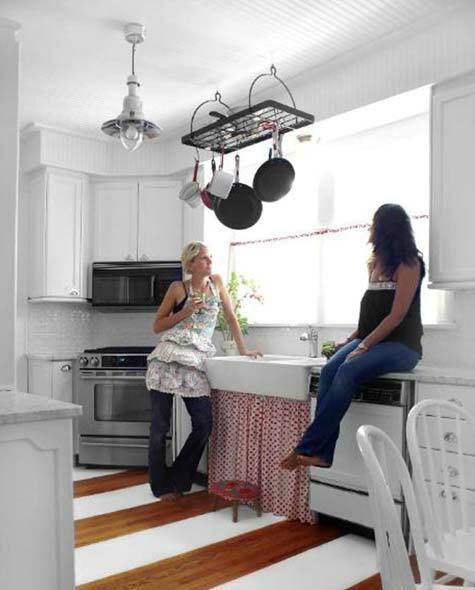 Kitchens are so fun and easy-going and forgiving of eccentricities that don’t go in or with the rest of the house. I think it’s a fabulous idea! 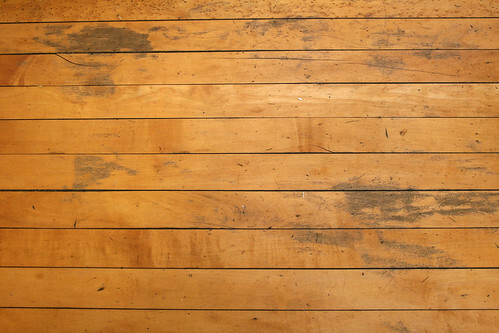 I plan to whitewash the wood floor in my bedroom this summer. The wood is in pitiful shape and I know painting it will really brighten my spirit! How does it affect resale? If you are thinking of moving in the short term it might be something to consider. I can’t remember — what does your floor look like now? Is it plain hardwood? If it is I would say, don’t paint it. Get a nice large area rug if you want some color. I don’t think I want a rug in the kitchen. That seems gross to me (sorry)! I know I spill and drop a lot in the kichen, and I want a nice hard floor that can be cleaned easily. Luka, resale is something to consider, but we’re going to be here for a long time (we think). quick(er), cheap(er)way to freshen them up. If they chip or look horrible you can always do something different. The rest of your kithcen looks great! Again, good luck! If you do it please post lots of photos! Hey Nicole! (It’s Erica from Paper Bride). Just had to chime in to say my husband and I just bought a new apt in Brooklyn and we painted all of our floors white (gasp!) Yep–the living room, bedroom, kitchen, everything–all white. And, I can’t tell you how gorgeous it looks. We have literally had people passing in the hallway as we are unlocking our door stop us to say how fantastically it turned out. EVERYONE told us not to do this and I have to smile everytime I walk through our front door now because I am so thrilled we ignored them all–I just love it so darn much. I can see that everyone has a very strong opinion on this, so I’m sure the painted floor haters are poised at their keyboards right now, but I happen to think that its a great option for many and for whatever reason, just not as common here in the U.S. In Europe, its absolutely everywhere. You can’t open one issue of Living Etc magazine that does not have at least two full spreads featuring a home with painted floors. I say go for it! P.S. We used benjamin moore porch/floor paint and I highly recommend it. It’s latex based (its illegal to use oil based paints on the floor here for some reason) and did not require an additional sealer. I love the look.Even when worn.Oh and when it has a different color to wear thru looks WONDERFUL! I think the cealing makes a world of differance too. Hey if you ever want to do a insperation spread on someone elses room let me know.I wnat to do the new houses formal living dining room in yellow black and white on a budget! Oh gosh, I love your kitchen!! Before I saw the photos I was a NO to painting it, but now I think, what’s the harm? If in a little while you hate it you can easily fix it with something else. Plus… I must admit, I just want to see what it looks like! just the humble opinion of an architect that works on lots of old homes in chicago. I am all for it! First of all, I think that you really want to do it and those are the things that tend to haunt me when I go against my decorating gut! Secondly, your home is your canvas, and you don’t seem to be a timid artist anywhere else. We have a 1920 craftsman style cottage with hardwood throughout (except for one of the bathrooms!) and when we bought the house the kitchen floors had been painted. According to multiple professionals, they cannot be refinished, so we are getting ready to repaint them. Right now they are painted a medium gray, which has been exceptionally versatile. Our cabinets are all white with brushed nickel hardware and our island is painted a dark gray. I have mulled over a lot of choices; I lean toward a high gloss white or black, but the hubby thinks we should stick with the gray. The floors had previously been painted a black and white check and this remains in the adjoining laundry room and although worn, is very lovely. Good luck with your decision! I am emphatically against painting wood floors, most of the time. I think it would really be an excellent fix for your kitchen. I so wish that we had that option: some previous owner put in pergo (which normally I love) that is in a light, faux hardwood pattern; of course the pergo in the kitchen goes perpendicular to the hardwoods in the rest of the house. Awful! And it was a diy job so none of the corners or edging are finished… cannot wait to re-do the kitchen (we have a 1930’s craftsman home). Well if you don’t like having a rug in the kitchen, why not make a pattern similar to that striped rug you liked so much, and paint it instead. You can do black&white or some other combo that might look mellower but still get some of that graphic style. Your floors are in great shape, for the sake of resale value, I seriously would not paint them. Refinish them, and seal with basketball court sealer. However, to see how well painted wooden floors hold up, check out the floor at Chicago Comics on Clark. The trick is to use tough epoxy based paint. That floor takes a beating and still looks great! a) A cork floor is not only extremely comfortable to stand on, but it is historically accurate to the style of home that you have. b) For holidays, like Halloween and Xmas, paint a floor rug on THE BACK of a large sheet of cheap linoleum. The texture is canvas, and I’ve seen many that are done in the Rosemalen style- think Ann Sather Restaurant. You could switch out every three months, and tuck the other ones in the attic, think of the versatility! Remember to seal with a polyurethane, and you’re good to go! I really like your kitchen, We are in nearing the end of completion of our kitchen ( we are building it our selves) and I would like a colour like your kitchen walls on my walls, what is the name of it? also as you are a keen ikea shopper have you ever had much experience with their couches? In looking at buying one of there extorp corner suit, what do you think about them? ar anyone else reading this, all suggestions are welcome!!! After reading all these comments I can understand why you should and why you shouldn’t paint your wood floors. However, in the end it’s your choice that really makes a difference. I think if you like the look then you should go for it! I have nothing against painted wood floors. I think they look great and have just as much appeal to them as non-painted wood floors. I think it’s a matter of taste and preference. I also don’t see what type of home you live in should make a difference? Bungalow or cottage style? I live in a apartment and have always wanted to paint one of my bedroom floors in white only because it’s a very dark room with very little light. Well, whatever your choice good luck! i say go for it… i liked really liked the paint/stain striped floors…you get the best of both worlds! if you hate it you can always refinish like you planned on anyways. After seeing pictures of your floor, I say go for it. Considering their condition, you may never get another chance like this. If you DON’T do it, you may end up regretting it forever. I say do it! I love the look of painted wood floors. There are only a few rooms where it makes sense and the kitchen is definitely one of them. I get why people are saying not to do it, but I guess I see it like this. The floors are not in great shape anyway. For them to be nice, as you point out, you’d have to strip them and refinish. So would any future buyer, whether you painted or not. And painting them is always undo-able. your great sense of (all) style tells me it will look amazing! i wanted to add another thought, i think it tends to look best with floors with wider boards! I say paint! But I’m a bit biased, because I have floorboards in my kitchen that are in very poor condition and have been thinking about painting them for 2 years or more! So I’m inspired by the pictures you’ve shared, and those posted by readers on this thread. Thanks! Oh, as for painting the trim – what’s that principle about painting skirting boards the same colour to make the floors float, or something? Can’t remember it, but I know there is a rule about making the room look bigger or smaller. I look forward to seeing what you eventually do! Back in high school my family moved to an old house with ugly hardwood floors. I painted my bedroom floor white and it was SO hard to keep from getting knicked and scratched. I probably didn’t do it right being all of 16, but I remember how hard it was and that put me off it forever. Now, I hear you on painting the wood. I wanted a craftsman because I loved the look of it all. And I was smitten with our home when I first saw it. Unfortunately, given the market we’re in, we had to put in an offer having looked at it for all of an hour. It wasn’t until we were going through the inspection that I noticed our lovely wood is actually ugly wood that’s BEEN PAINTED WITH A WOOD GRAIN. And it’s starting to flake and peel. Not cool. So yeah, I’m considering going all white. Husband is SO against this, but really, I’m not doing anything that hasn’t already been done with a different (stain) color. You must check out my friend’s blog. They ran into a similar situation with a few pieces of the flooring not matching. They did a harlequin pattern of paint and refinished wood and it looks amazing. Hey- Do you know what was used on the door windows in Elena Colombo’s colorful kitchen????? I love it. I’ve subscribed to your blog for two reasons: the Washington Post recommendation and, I used to live in Oak Park! I like your blog and plan to visit it regularly. So, did you paint your kitchen floor?? We Just Painted the plywood flooring in our great room/dining room. We were going to do hardwood but the new sliding doors led to rotted sill plate and the install of sliders took so much of the vinyl siding that we are doing hardiplank and the install of the new sliders requires repair of Sheetrock etc. We used oil based stain paint can’t remember the name and oil based porch and floor-ok but I don’t like the tan color I wish I had used black. White sounds nice but 220 lbs of dogs and a ten lb cat shedding-course black probably just as bad. Good luck I know whatever you choose will look great!